Delightfully-quotable Kathryn Campbell died on March 16, 2019 in Southfield, at the age of 97. “I’ll have just a half,” was one of the most familiar and beloved of Kathryn’s sayings, usually in reference to a second helping of dinner or a bit of dessert. Those who knew her best knew that she would often return to the remaining half and take “just a half” of that as well, and Kathryn knew that they were onto her as they lovingly teased her about it. “Just a half,” however, would not be an accurate way to describe Kathryn’s life. Not only did she live an exceptional 97 years, she lived those years fully and well. Born in Grayville, Illinois on November 28, 1921 to parents Edith and George Woodham, joining older brother Francis, and later joined by younger brother Alan, Kathryn often talked about her childhood in the country. The family moved to Detroit early in Kathryn’s life, and she was proud to say that she was a product of a Detroit Public School education, and was most taken with the fact that her school had a swimming pool, which she loved. Kathryn’s school career started off on an amusing, truant note: on the first day of school, her older brother was walking her to school, but he was taller and faster, and, frustrated that her younger, shorter legs couldn’t keep up with him, Kathryn turned around and went back home, effectively skipping her very first day of school! She would lament her short legs throughout her life, always laughing that if she sat fully back on any couch, her feet dangled and couldn’t reach the floor. Kathryn met her first husband, Gayle Dunkerley, at a sing-a-long in the days when she was working as a stenographer. They married on August 11, 1943, after Gayle had enlisted as a serviceman in the Army Air Corps during World War II and completed his training, before he left to fight on the European front. They had only a couple of days together after their wedding before Gayle left for Europe, and shortly thereafter, his plane was shot down and Gayle spent over a year as a Prisoner of War in Germany. Later, reflecting on that time, neither Gayle nor Kathryn were particularly ruffled by it; indeed, Kathryn had taken this in characteristic stride and had great inner peace about the uncertainty of that time—a peace which would be at the core of her being throughout her life. When Gayle returned from the War, he and Kathryn threw themselves into living and beginning a family. They were faithful members of Cana Lutheran Church (formerly Gethsemane) just a mile or so from their home in Berkley. 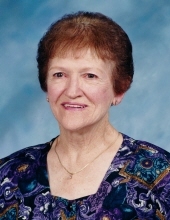 Kathryn enthusiastically took part in the full life of their congregation--women’s circles, service opportunities, and worship, where later in life she would keep her grandchildren entertained and quiet with a store of hard candies from her purse. She was a woman of quiet and unwavering faith in not only her God, but in her family and all the people she loved and the causes most important to her heart. Among Kathryn’s many gifts and passions were sewing, gardening, golf, knitting and crocheting, reading, crossword puzzles, playing cards in a Bridge league for years, and with her family, though she was often accused of tweaking the rules to suit her needs when card-playing with family! Kathryn loved a good game night with family, giving them fits of laughter with her ever-quick wit, making puns, coming up with a good zinger, and making herself ever-more-quotable. She baked cookies so often that grandchildren always looked for Grandma’s cookie jar, and she loved to cook for her family, whether or not they enjoyed stewed tomatoes (they did not). She was always humming while she was in the kitchen. A meal with Kathryn was always a thoughtful and intentional time; she took time, paid attention to the ritual of setting the table, gathering people, blessing the food, and having meaningful conversation all the way through the meal, dessert, and coffee, never rushing, simply present with those whom she loved most. Kathryn’s greatest passion was indisputably her family. She happily dedicated her life to being a wife, mother, grandmother, and great-grandmother, and her pride and devotion were clear to all. Even in her later years, as she struggled with Alzheimer’s Dementia, she was entranced by her youngest great-grandchildren and lit up whenever they were near. Her home was always open for visits, overnights, or refuge; three of her grandchildren (and their spouses and children) lived in her home at different times of transition, and it was always communicated clearly that they were welcome as long as they needed a soft place to land. Kathryn is survived by her loving husband, Frederick J. Campbell; her five children: Nancy (Rick) Hardt, Paul (Lyn) Dunkerley, Bonnie Dunkerley, Tom (Christine) Dunkerley, and Sally Dunkerley; five grandchildren: Dan (Jenn), Jill, Peter, Sarah (Christopher), and Scott; and eight great grandchildren: Josh, Kira, Maggie, Miles, Sofia, Adam, Luke, and Charlotte. Kathryn was preceded in death by her parents, Edith and George Woodham, her brothers, Francis and Alan, her first husband and the father of her children, Gayle Dunkerley, and one granddaughter, Laura. Visitation will be held on Saturday, March 23rd beginning at 9:00 am at Cana Lutheran Church, 2119 Catalpa Rd. Berkley, with a Memorial Service beginning at 11:00 am. In lieu of flowers, memorial donations can be made to Kathryn’s church of many years, Cana Lutheran; The Alzheimer’s Association, Smile Train, or the cause Kathryn was most devoted to supporting: Planned Parenthood. To send flowers or a remembrance gift to the family of Kathryn L. Campbell, please visit our Tribute Store. "Email Address" would like to share the life celebration of Kathryn L. Campbell. Click on the "link" to go to share a favorite memory or leave a condolence message for the family.